Prevent airborne dust from escaping your material handling conveyor. The Triple Tail Seal is a robust, high-performance conveyor component that eliminates fugitive particulates from escaping at the beltline from the entry to the load-point dust collection hood. The majority of airborne dust in a metallurgical process facility is associated with conveyors—load points, discharge points, dust collection hoods, transfer chutes—the list is long. Corrosion Engineering has developed a robust, high-performance conveyor component that eliminates fugitive particulates from escaping at the beltline from the entry to the load-point dust collection hood. Control of fugitive dust is more important than ever, as workplace environmental requirements become more difficult to achieve. Whatever can be done to improve the performance of fugitive capture and collection systems should be implemented. The Corrosion Engineering triple tail seal will control all particulates and improve the performance of the dust capture and collection system by eliminating leakage at the inlet to the load-point hood. The triple tail seal is sold as a unitized assembly that is simply bolted to the flange at the inlet to the dust collection hood. The contoured seals have already been trimmed to the profile of the belt. The triple tail seal is fully adjustable, and, if guarding permits, seal tension can be controlled while the conveyor is operating. 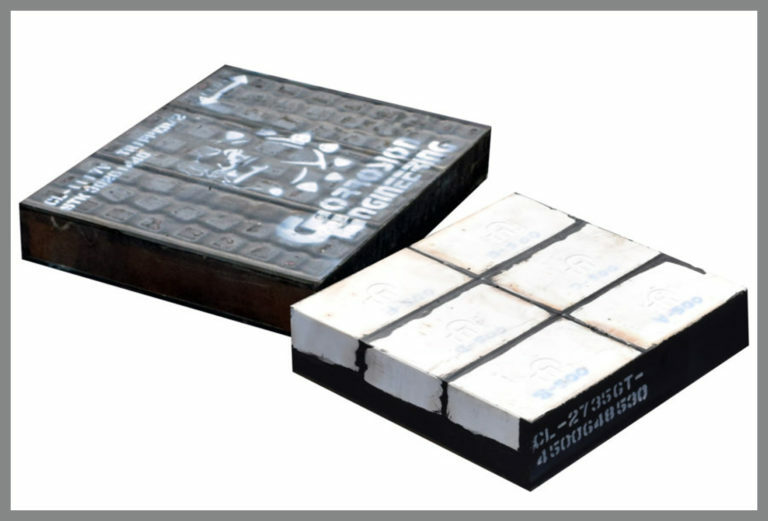 The three heavy rubber seals are compounded with Corrosion Engineering’s moly rubber, a high-performance rubber compound to which molybdenum disulfide is added to reduce friction and wear. The triple tail seal will not degrade nor reduce the life of the belt. The Corrosion Engineering triple tail seal is an engineered system, engineered for performance and engineered to be maintained. When the triple seals wear to the point that there is no more adjustment, Corrosion Engineering will provide three new seals, which can be readily installed in the seal housing while the triple tail seal assembly is installed on the conveyor. Replacement of the three seals, including adjustment, requires less than 30 minutes.